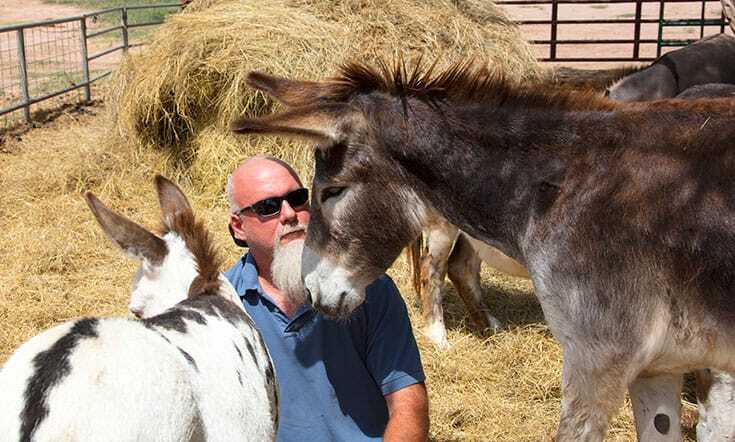 Give him five minutes and Mark Meyers, the Buddhist founder of Peaceful Valley Donkey Rescue, can make anyone fall in love with the oft-ignored animal. With nearly 9,000 donkeys rescued in his 17-year career, Meyers is generating compassion for donkeys around the globe. Peaceful Valley Donkey Rescue founder Mark Meyers with Jobe. Buddhist donkey rescuer Mark Meyers practices compassion on a daily basis, reducing the suffering of and raising awareness about this oft-ignored creature. 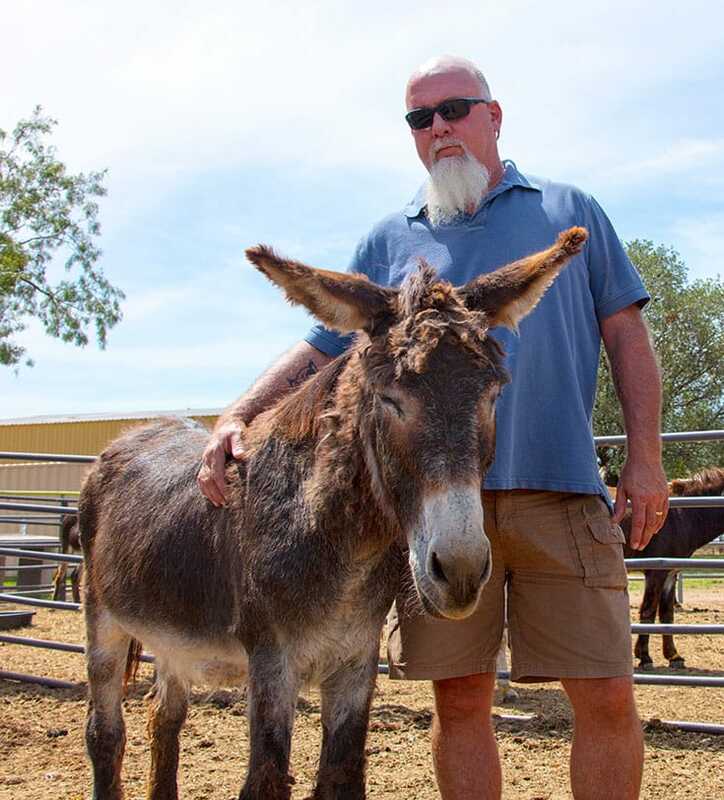 Based in San Angelo, Texas, Meyers’ organization, Peaceful Valley Donkey Rescue (PVDR) — the largest donkey defense organization in the world — has rescued roughly 9,000 donkeys in its 17 years of operation. It currently cares for over 3,200 donkeys spread across 30 locations, with a focus on rescue, rehabilitation, and adoption. Donkeys, says Meyers, are generally misunderstood. They’re often seen as being stupid and stubborn, ridden by the sidekick in TV and films, while the all-American hero rides a horse. Though wild donkeys, called burros, are as protected as wild mustangs under the Wild Free-Roaming Horses & Burros Act of 1971, they are paid far less attention, and can become a nuisance when in large groups in the wrong place. 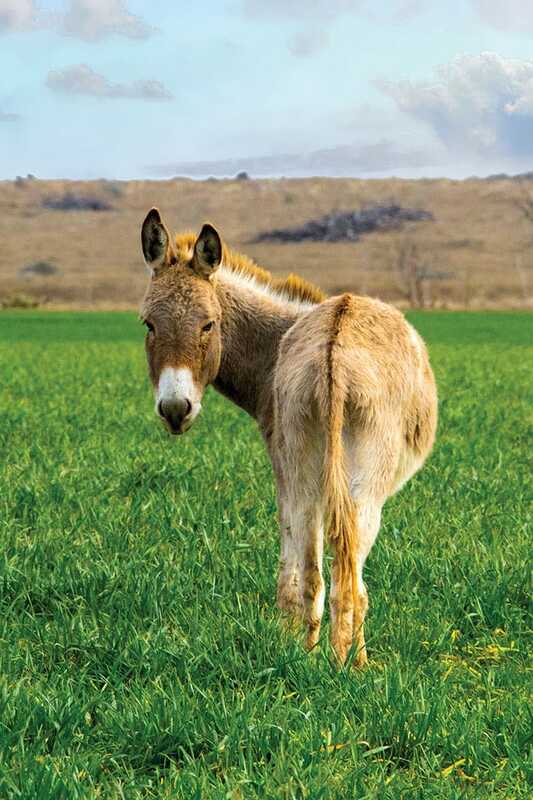 As NPR reported in June, large populations of burros can become quite troublesome, fouling springs, overgrazing and competing with livestock for grazing land, and driving away native species. After Meyers and his wife fell in love with their first donkey, they began to notice others in their community suffering from ailments such as malnutrition and severely overgrown hooves — two common signs of abuse and neglect. By 2005, the couple was caring for 25 donkeys in their own backyard and decided it was time to open an official rescue. Meyers with Alexis and Billy. PVDR originally focused on rescuing abused and neglected donkeys, but after an amendment in 2004 to the Wild Free-Roaming Horses & Burros Act stated that animals over 10 years of age, or those who had failed adoption three times, could be sold — typically to slaughterhouses that feed the global skin market in China, PVDR began to rescue burros by the hundreds, working with federal government state agencies and law enforcement across the country. Meyers has found his Buddhist practice to be greatly aligned with and informed by his work as a donkey rescuer, and vice versa. In the early days of donkey rescue, Meyers would come home from his contracting work and sit with the mistreated donkeys, sometimes chatting, and other times in silence, just “being with the donkeys” — a meditation of sorts. “You’ve got a lot of time, when you’re sitting in the pens, staring at a donkey, to practice — to push those unimportant thoughts out of your head.” he says. One of Peaceful Valley Donkey Rescue’s donkeys, Jules. Meyers came to Buddhism many years ago, while trying to master a new hobby, archery. He had started consulting books on the subject, and soon came across a book about Zen archery. “All of a sudden, it all made sense,” says Meyers. At the time, he was only dipping into Buddhist practice so that he could put the arrow in the target. Later, while working as a contractor, Meyer’s started thinking about Buddhism again. He began studying Buddhist practice through books, and still does, as the closest Buddhist center to his home in San Angelo is about six hours away in Houston, TX. In donkey rescue, it’s important to maintain a practice of mindfulness, says Meyers — something he tries to impress on his staff members. Capturing burros, by the hundreds, requires him to be patient and grounded in the present moment. Donkeys, says Meyers, only respond to patience and kindness — they won’t be bullied into trusting you, and there’s little room for multitasking when dealing with a large group of wild animals. “If I walk into the pen in an aggressive mood, and I’ve got to get a hundred donkeys vaccinated and I’m being aggressive, they respond differently then if I were to walk in being calm,” he says. 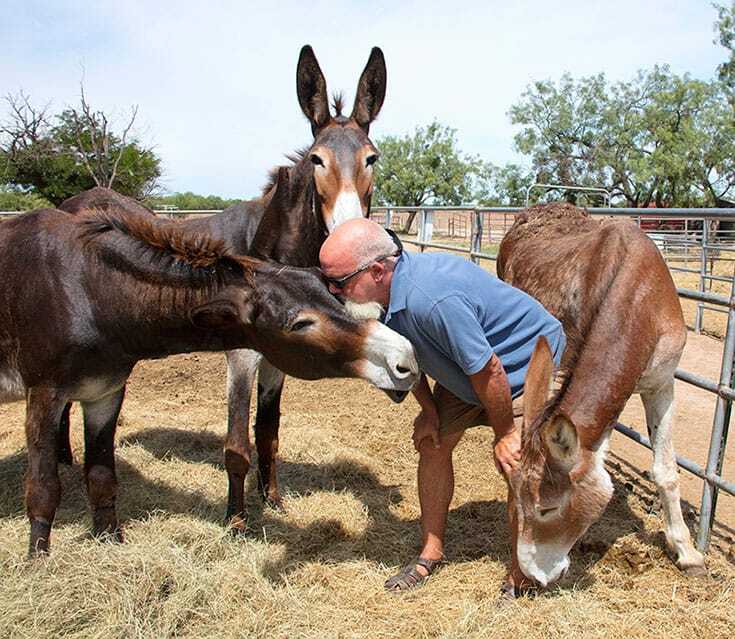 Peaceful Valley Donkey Rescue founder Mark Meyers with Houdini, Pepe, and Stormy. Meyers notes that compassion comes from the donkeys as well, as they often look to keep the people around them safe. 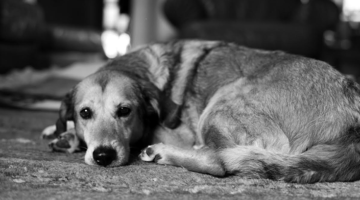 He’s observed a notable difference in their behavior around disabled people who visit PVDR to work with therapy donkeys, and around small children. Beyond rescuing donkeys, a big part of Meyer’s job involves outreach and education, which he travels all over the country to do. Give him five minutes, he says, and he can make anyone into a donkey lover. 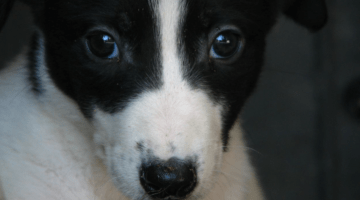 For now, PVDR has nearly covered the entire United States, though there will always be rescue work to do. In the coming years, Meyers hopes to start doing more donkey rescue in the Caribbean — the subject of his most recent book, Donkeys of the Caribbean, which documents how the donkeys of Bonaire, Sint Eustatius, and Nevis once “helped produce wealth and prosperity in the Caribbean for more than 500 years,” but are now seen as a problem and largely neglected. PVDR is also focused on rehabilitating donkeys for adoption, as Meyers says they make great pets and companions. 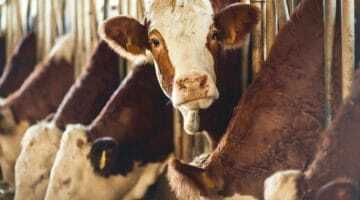 Currently, the organization adopts out around 400 donkeys a year, a number Meyers hopes will grow, and one that, if he continues spreading his message of compassion, certainly will.